Prestamp and postoffice period up to 1862. Austrian post offices and postablagen 1862 to 1938. German post offices: German (1938-1945) & Austrian (1945-1950) territory. Austrian post offices (cancellers without postcodes) 1951 to 1966. Austrian post offices (cancellers with postcodes) from 1966. The Kleinwalsertal is an isolated valley, part of the Austrian federal state of Vorarlberg, from the rest of which it is separated by a high mountain range. The highest peak is the Widderstein at 2535m, and the valley is surrounded by a ring of mountains many over 2000m. The only natural route into the valley leads from Oberstdorf in Bavaria along the narrow gorge of the river Breitach; from Vorarlberg the valley can be reached only on foot over a few high passes. 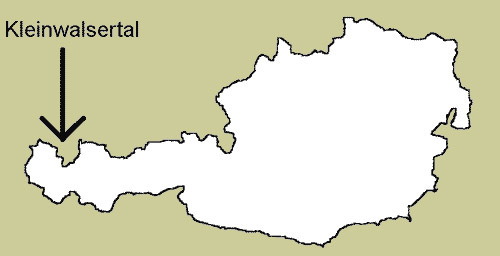 The map below shows the location of the valley in Austria. In the second map, the mountains have been indicated by the grey shading; the German-Austrian border by a dotted line; and the roads by solid lines. The area itself is almost 100 sqkm large and has about 4500 inhabitants. The first immigrants came from the Wallis district of Switzerland and settled in what is now Mittelberg; their old homeland gave the Walsertal its name. Today the inhabitants of Kleinwalsertal are a mixture of immigrants from all federal states of Austria, especially from Vorarlberg. During the Anschluß period about 1500 Germans immigrated, many of whom took the option in 1945 of becoming Austrian citizens. Politically, the Kleinwalsertal is a Gemeinde of Bregenz in Vorarlberg, called Mittelberg. With time, further settlements developed (Baad, Hirschegg and Riezlern), and today Riezlern is the largest and most modern. A location with such a unique situation has a similarly unique postal history, which will now be described and illustrated. The complications of fiscal transactions and their markings will be ignored; readers who require more information should contact the editor. In 1891, Father J. Finch and Dr. H. v. Klenze wrote a history of the postal arrangements up to that date in the 'Mittelberger Chronik', from which the following four paragraphs are derived. The postal connections for so lonely an area are naturally a relatively newer arrangement, and until the middle of the 19th century there was no alternative to sending the letter by a messenger to Sonthofen who handed it there to the Royal Bavarian Post. On 18th January 1840 the Gemeinde wrote to the Royal Bavarian Post Office at Immenstadt, stating that they would like to exchange the Walsertal mail with the Oberstdorf messengers. For mail to Austria, however, the troublesome route over the mountain passes to Bezau remained. In the year 1846 the Gemeinde contracted with one Anton Wallina to carry letters and money once a week to and from Bezau. From there they were exchanged with the messenger from Au, where they were handed over to the Austrian Post. Letters from Austria to the Walsertal were mainly brought by the tobacco carriers, who were not allowed to enter Bavaria and used the Starzljoch. Heavy snowfalls and avalanche danger often interrupted the traffic over the Starzljoch for weeks or even months. On 20th January 1852 the district authority announced that the letter mail from Bezau and Bregenz would be routed via Sonthofen, and the post wagon would also call there. Since Oberstdorf had no postal delivery system, all postal items were collected from Sonthofen by Oberstdorf messengers, and the messenger employed by the Gemeinde picked them up twice a week at Oberstdorf. In 1862 the post office at Walschschanz was erected, and in 1877 the Karriolpost (it's a light covered cart) began running between Oberstdorf and Mittelberg, at first three times weekly, later four and from 1885 on all work-days. In 1886, Post Offices were opened in Mittelberg and Riezlern, with a Postablage in Hirschegg, and the Walserschanz post office was demoted to a Postablage. In the winter a Rural Post connected with the Karrriolpost. 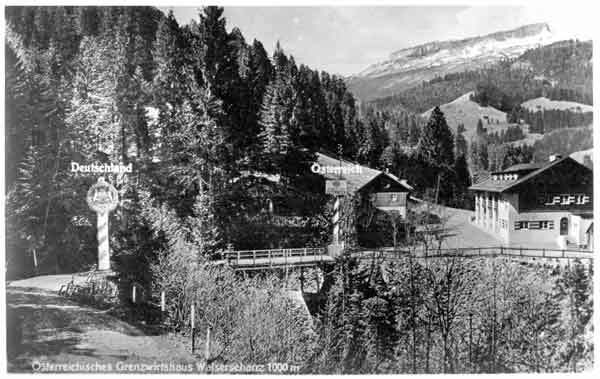 Before the first post office opened in Walserschanz, post to and from Kleinwalsertal can only be recognised by the address of the sender or recipient. Since from 1 June 1850 Austrian mail (in general!) required stamps, this in Kleinwalsertal can be called the 'pre-postoffice period'. Mail from Kleinwalsertal had to be brought to Bezau post office, and was there given adhesive stamps which were then cancelled there also. 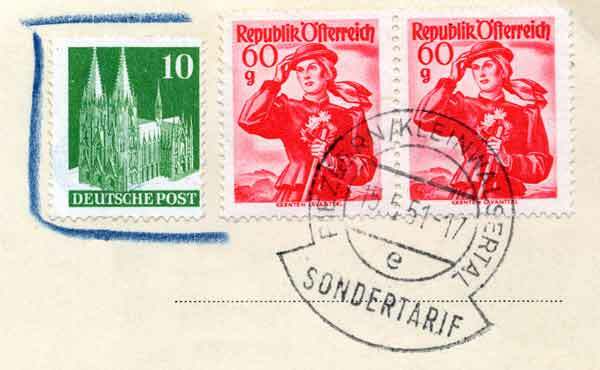 Naturally mail could be handed over also in Sonthofen or Oberstdorf; however it then had to be stamped with Bavarian stamps. 2. Austrian post offices and postablagen - 1862 to 1938. On 1st July 1862 the first post office in Kleinwalsertal opened. It was directly on the boundary with Bavaria and was called WALSERSCHANZ after the border inn. It was active as a post office till 30 June 1886, and was run by the innkeeper Ludwina Fritz. After that (until 1914) Walserschanz was a postablage. With the opening of this post office the second period of the Kleinwalsertal postal service begins, and extends up to the Anschluß. In this period the Austrian postal administration opened further post offices and Postablagen, so that the situation in 1938 was the same as today. Austria joined the Bavarian Customs Union on 1.5.1891; this however had no postal effect, since mail from Austria-Hungary (or from 1918 from Austria) to Germany was charged at Austrian inland rates. On 29 July 1886 both Mittelberg and Riezlern received their own post offices. The post office at Riezlern was in the Gasthaus zur Traube, Hailer's bakery, and the Angel Hotel, until it moved on 5 November 1960 to its own building. In Mittelberg it was in the Zum Widderstein, then in a house (which is still called the Alte Post) until its new office opened in December 1964. Until 8 July 1929, Hirschegg had only a postablage (it opened in the Zum Hirschen around 1900); as a post office it is housed in the Mesnerhaus. Baad, at the inner end of the valley, has never had any postal facilities! When Walserschanz was demoted to a Postablage in 1886, it continued to use its cancellers directly on the Austrian stamps. Since it delivered most of its post to the Bavarian post office at Oberstdorf, and this was not allowed to cancel the Austrian stamps with its canceller, the normal rule was here reversed: Walserschanz cancelled the Austrian stamp directly, the Bavarian post office at Oberstdorf cancelled beside the stamp. Post up the valley to Mittelberg was cancelled according to the regulations. The cancel on the left is on an 1893 card with attached reply portion, addressed to Frankfurt a.M., with the sender's address given as Oberstdorf (ie in Bavaria!) and a different Oberstdorf address pre-written on the reply part. I suspect it was purely philatelic, as such a card would not be on sale in Oberstdorf, and probably not at a Postablage either; and the card would not have been valid for the return trip! There are no other markings on the card, and one wonders if it ever entered the postal system. The card below shows a 1905 cancel from Walserschanz ON the stamp and the Oberstdorf cancel beside it. In March 1938 the post offices were taken over by the German postal administration, and as in the rest of Austria introduced German stamps on 4 April 1938. As elsewhere, some Austrian stamps remained valid up to 31 October 1938, so mixed frankings exist. The Gemeinde Mittelberg changed its country allegiance, being detached from Vorarlberg and connected to Bavaria; and the post offices likewise switched from the PTD at Innsbruck to the Reichspostdirektion at Augsburg. Thus the offices acquired also the German post code 13b (Postleitgebiet South Bavaria), not 12a and 12b as in the rest of Austria. The German postal administration introduced new cancellers, with the previous designation of Vorarlberg replaced by Kleinwalsertal. Also, for the first time, advertising cancellations (Werbestempel) were introduced for all three post offices. 3b. German post offices - 1938 to 1950. (b) Austrian territory 1945 to 1950. In 1945 Kleinwalsertal became reunited with Vorarlberg, and so with Austria. The post offices remained however under German postal administration up to the 31st December 1950 (American zone, then German Federal Republic). The superior offices were Oberstdorf and Kempten (Allgäu) 2. As well as the Austrian stamps, a range of German stamps were valid in Kleinwalsertal: American and British zone and Federal Germany [Mi 1-122]; Occupied Germany [Mi 911-970]; from 3rd October 1949 the stamps of the French zones: Baden [Mi 14-41 & 46-57], Rhineland-Palatinate [Mi 16-29], 32-41, & 46- 52, Württemberg-Hohenzollern [Mi 14-37 & 44-52]; and from 20 January 1950 the stamps of West Berlin [Mi 21-73]! 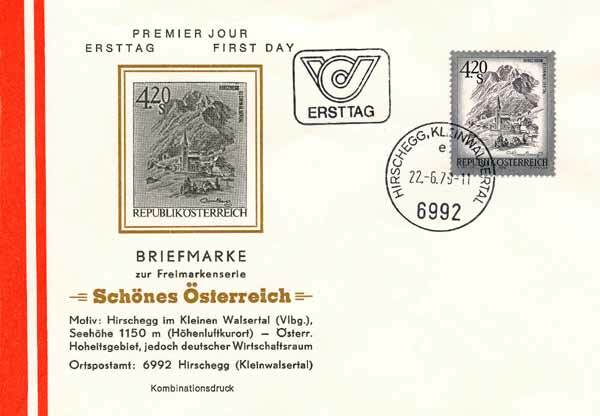 Austrian stamps were used for Austrian inland mail (including local mail in Kleinwalsertal). 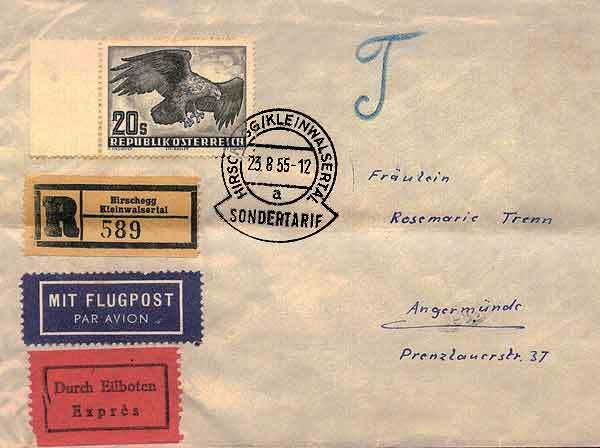 Up to mid-1947 the Austrian domestic mail (Kleinwalsertal to Austria) had to be submitted to BPA1, the US Censor in Munich. Thus one finds on Austrian domestic mail up to this time the red machine cancel of the US Censor in Munich, although in the western zones of Austria the censorship had been discontinued. German stamps were valid for mail to all zones of Germany, later FRG, GDR, Saarland and West Berlin; in the local Kleinwalsertal; and to all foreign countries. For mail to Germany the German domestic rates applied, for foreign countries the rates of the US zone of Germany. Thus within Kleinwalsertal both the Austrian as well as the German stamps were valid. So one could use for one and the same shipment Austrian or German stamps, which one bought at one and the same post office counter! Mixed frankings were possible, since up to the currency reforms (Austria 3:1 in December 1947; West Germany 10:1 in July 1948) the exchange rate was ÖS1= RM1. 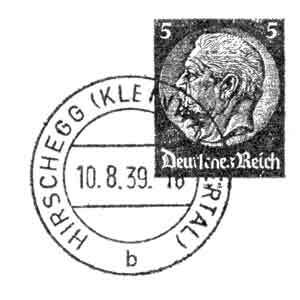 Indeed the use of Austrian stamps was discouraged, since Bregenz had to pay for them in exchange for the services of the German post in the Kleinwalsertal. After the German 10:1 currency reform, one could use on 21 and 22 July 1948 in Kleinwalsertal 10-times-franking, or mixed franking between the old and the new stamps. 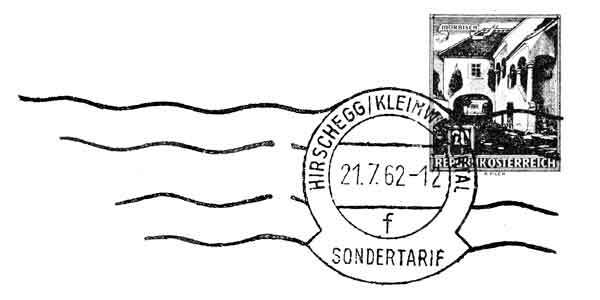 Since Kleinwalsertal is Austrian territory, but the post offices Mittelberg, Hirschegg and Riezlern were under German postal administration, mail stamped with German stamps should be considered as German Post in Austria (1945 up to the currency reform of July 1948) or West German post in Austria (from currency reform July 1948 to 31 December 1950). 4. Austrian post offices. (Cancellers without postcodes. 1951 to 1966). On 31st December 1950 the German administration of the post offices of Kleinwalsertal ended, and they were taken over by the Austrian postal administration (PTD Innsbruck) on 1st January 1951. 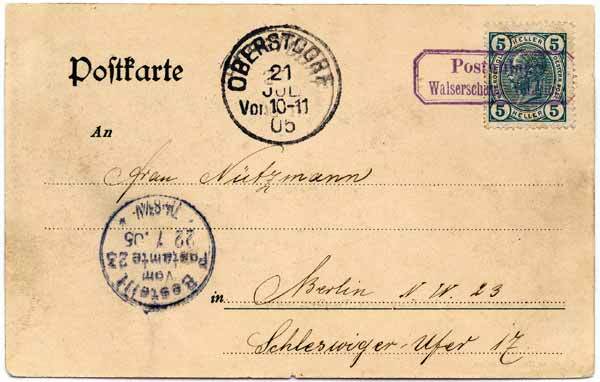 On the same date the sale and the validity on mail of German stamps ended, and mail to Germany had to carry Austrian stamps; likewise all foreign mail now required Austrian postage. At the same time the German cancellers were replaced with Austrian ones. It took some time to formally agree the arrangements, and a Memorandum of Understanding called the ÜZAG (Übereinkommen Zollausschußgebiet) was duly signed in October 1952! The Austrian stamps were sold at the appropriate exchange rate in DM. From 1.1.1951-30.4.1961 this was 1:6; from 1.5.1961-31.10.1969 1:6�; and from 1.11.1961 1:7. A good example of the ensuing complications is that when the 1:6� exchange rate started, there was no combination of Austrian stamps with which a postcard to Germany could be correctly franked! The post offices had also to sell Austrian stamps for Austrian shillings at face value, so that both currencies were valid side by side. 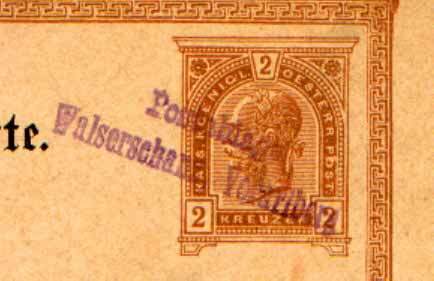 For example, Austrian stamps with face value 1.40 and 0.70 (to make up a German rate of 30pf) could be bought for 2.10 Schillings as well as for 30 Pfennig. To ease some of the more common transactions, stamps with face values 4.20 and 5.60 (ANK 1644 & 1742) were issued on 22.6.1979 and 1.7.1982 respectively, being the direct equivalent for the then-current 60pf and 80 pf German inland letter rate. 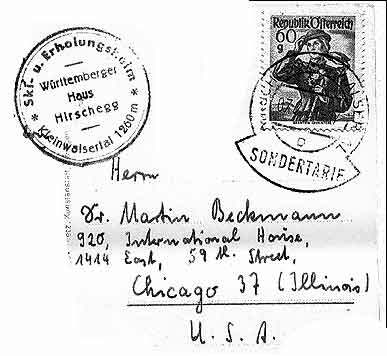 The basic arrangement was that mail from Kleinwalsertal to Germany would carry Austrian stamps but pay the German inland rate. Mail to Austria paid the Austrian internal rate; to anywhere else it paid the Austrian foreign rate (or should have - see examples later!). 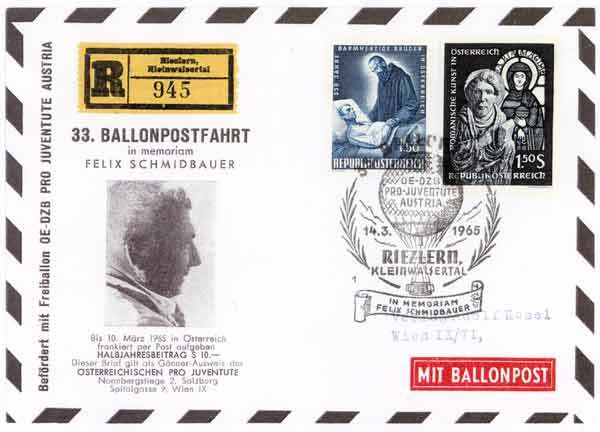 To indicate to the German delivery offices that the mail was stamped fully and should not have postage due levied, specifically produced postmarks were used; they carried the additional word SONDERTARIF or POSTSONDERTARIF(sometimes in the wording of a slogan), or had the German post code number instead of the Austrian one. The rate was calculated by converting the German postal rates into Schillings at the official exchange rate. A special rule stated that, if the Austrian foreign mail rate was cheaper than the German inland rate, it could be used instead. This happened quite frequently, especially with heavy, Registered and Express mail, and an interesting study of the comparative rates is possible. It seems that several commercial firms used this discrepancy to their advantage! The post office employees were probably not so pleased, as the mail in either case carried Austrian stamps and they were under strict instructions from the Innsbruck PTD to calculate which country's rates had been used and then apply the correct canceller before putting the item in the same postbag. A registered letter posted to Berlin on 22.6.1979 cost 60pf postage + 150pf fee = 210pf, which at 1:7 is 1470 Groschen Sondertarif. A registered letter posted to France on 1.6.1983 cost 600gr (CEPT rate) postage + 1000gr fee = 1600 Groschen normal Austrian foreign rate. Another fine mess! The piece above is from a card posted on 15.5.1951 to Great Britain, when the German foreign rate was 20pf which at 1:6 is 120gr - and indeed there are two 60gr stamps. However, the Sondertarif only applies to German inland mail, so the special cancel should not have been used. Furthermore, the Austrian foreign rate at that date was only 100gr; and the use of a German stamp was not only superfluous but also invalid (as from 1.1.1951). It was to a philatelist, I note..
A registered postcard posted on 22.6.1984 would cost 60pf postage + 200pf fee = 260pf, which at 1:7 is 1820 Groschen Sondertarif. However as normal Austrian foreign mail it would cost 400gr postage + 1000gr fee = 1400gr, so that is what the sender would do! The next example is a letter sent in 1955 to the small town of Angermünde in the Uckermark, a region in the north of Berlin. Despite its being sent registered AND express AND air mail (what route?? ), it took three days to arrive. A clue may be the Munich BPA1 backstamp; and the rates do not add up to 20Sch. The elegant script T seems to have had no effect. Any ideas? An example of an Ortswerbestempel (a local advertising slogan) on a postal stationary card. Note the POSTSONDERTARIF is in the slogan, not the cancel. The cancellers with the 'counter letter' b were usually kept in the post office at Oberstdorf in Germany. The reason for this was that in the Postbox on the regular German postbuses between Oberstdorf and Mittelberg, mail was often deposited with Austrian stamps when the bus was on the Austrian part of the route. This mail would have had to be sent back by Oberstdorf to Riezlern to be cancelled. To avoid this delay, this canceller was made available in Oberstdorf for the cancelling of mail to Germany, to Austria, and to foreign countries. Finally, this registered item of printed matter was flown on the 33rd 'Pro Juventute' Balloon Post on 14 March 1965. It took off at 11:15 from Riezlern and landed at 16:04 at Binnings near Kaufbeuren in Tirol. The portrait is of Felix Schmidbauer, who had taken part in many similar flights. The franking is 50 groschen inland printed matter plus 250 groschen inland reistration fee, making 3 schillings in total. 5. Austrian post offices (cancellers with postcodes) from 1966. 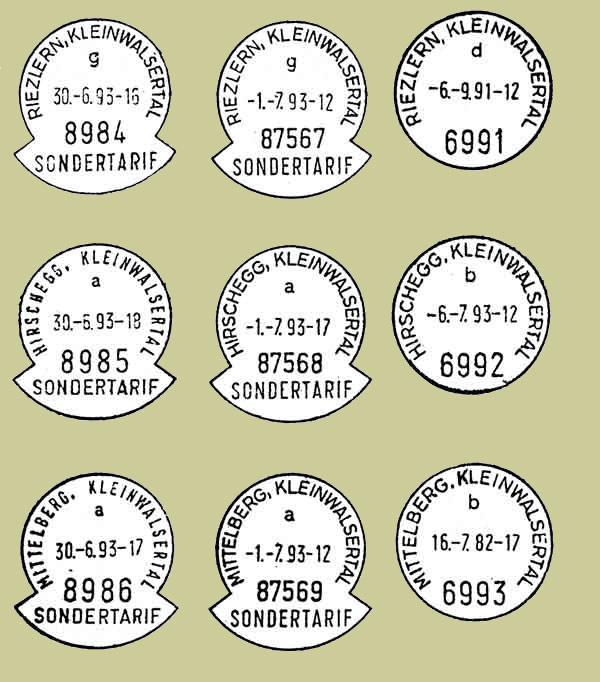 With introduction of postcodes in Austria, the Kleinwalsertal post offices were assigned new cancellers. Due to the German inland tarif arrangements they also received cancellers with SONDER/TARIF or POSTSONDERTARIF and with German postcodes. Thus the three post offices of the valley have both an Austrian and a German postcode (they now have a 5-digit German code). See illustrations below. The postmarks with the Austrian postcodes and the machine cancel with the German postcodes were used for the first time on 11.7.1966; the remaining postmarks with the German postcodes from 11.8.1966. The introduction of postcodes produced interesting complications, as in Austria the place-name was not mandatory, the numeric postcode alone sufficing. Much mail from Kleinwalsertal addressed to Austria was thus delivered to the German town with the same postcode number: for example, mail to Vienna often went via Berlin! Finally, a meter mark for Austrian mail from the Council Office. The cancellation listings below are the author's compilation from the various sources at my disposal. I have used my own judgement where they are incompatible: for example I have 'downgraded' one source where the text does not match its own illustrations! For the APS cancellation coding system see here. In the tables below, '/' means 'new line' but '//' means that there is a '/' in the actual text of the cancel. Types B1 and B2 are the two 'modified keyholes' illustrated here ('B' means 'special cancel, cannot describe, must illustrate'). In 1886 (according to the local source) or 1900 (Kuhnel), a postablage opened in Hirschegg (in the Zum Hirschen); on 8th July 1929 it was elevated to a Post Office and housed in the Mesnerhaus. K. k. Postablage HIRSCHEGG, P. Riezlern Eo (rubber canceller). On 29 July 1886 Mittelberg Post Office was opened in the Zum Widderstein, then in a house (which is still called the Alte Post) until its new office opened in December 1964. Walserschanz was opened as a post office on 1 July 1862 and was active till 30 June 1886. After that Walserschanz was a Postablage until 1914. POSTABLAGE WALSERSCHANZ, VORALBERG. gLo 43x8 7.1898-?